Think about that for a minute. Perhaps post your thoughts in the comments before continuing. I read the e-mail a dozen times, and I couldn’t figure it out. No the one that has the whole pickles in a jar with one standing up against the jar on the outside. I saw it on your blog. With that one line, the mystery was no more. It wasn’t a case of mistaken identity between me and renowned pickle photographer Jamey Steggoomer…no, it was a misunderstanding about my use of a random Google Image on this blog entry. Alas. So close. I was ready to ride this one out to the fullest, including going to the grocery store to buy a jar of pickles solely to take artistic photos of them for this person. It would have been magical. This entry was posted on Friday, November 14th, 2014 at 1:02 am	and is filed under humor and tagged with humor. You can follow any responses to this entry through the RSS 2.0 feed. is there any way i can get a 8 1/2 X 11 of you and you’re cat. i have a…uh…’friend’ who could use that. but he won’t pay for it. please let me know. HAHAHA! That was hilarious! 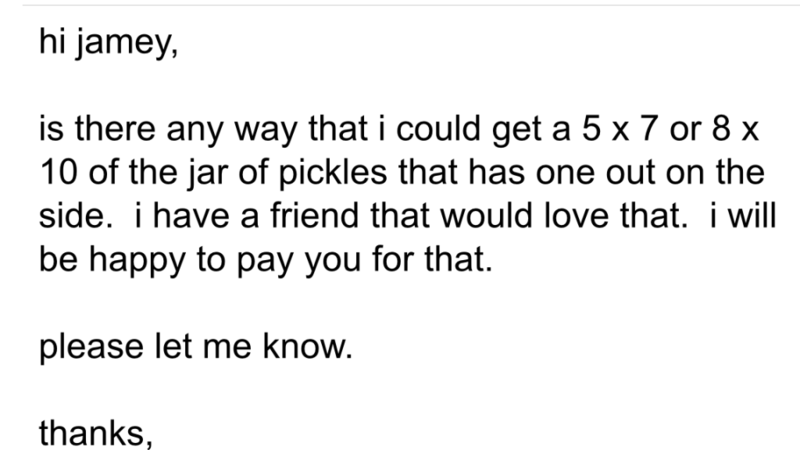 It even funnier since its a jar of pickles, how random is that! Also, I totally emphasize with your disappointment after now knowing what they were asking for. The mystery is part of the fun! I’m glad you enjoyed it as much as I did. 🙂 I really wish it could have continued for a while. 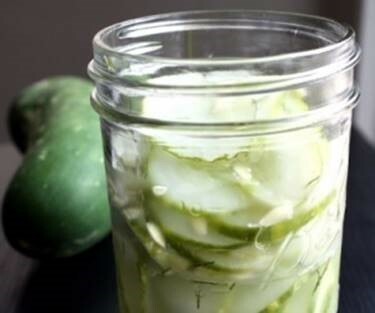 I don’t see why not…if it doesn’t work out, I’ll still get to eat some pickles. So…did you know when you posted this that 11/14 is National Pickle Day? ?